Scattered primarily throughout the Luoyu Region of southeast Tibet, the Luoba, with a population of 2,965 are the smallest of China's 56 ethnic groups. Their name is derived from the Tibetan word for southerners. Economy:Living at the foot of Himalayas, almost completely isolated from the outside world and kept in virtual slavery by the government of Tibet, the Luoba lagged behind the rest of the world until the 1950s when with the help of the Chinese government, all aspects of their life began to improve. Blessed with a wide variety of resources, ranging from animals and plants to minerals, the Luoba economy is based on agriculture and hunting. Language and Character:The Luoba language, which belongs to the Tibetan-Burman group of Sino-Tibetan languages, has no writing system, so most Luoba speakers use Tibetan characters. The legends of the Luoba have been passed on orally, often using Jiajin, a unique melody used for relating traditional epics. Belief:The Luoba people believe that the world is filled with spirits which dominate their lives, control nature, cause disasters and bestow happiness. They pray to the spirits, seeking blessings, and believe that shamans have the power to control them. Food and Food Custom:Because of the proximity of the Luoba ethnic minority to the Tibetan people, the food, culture and customs resemble those of the Tibetans. The staple foods are rice, corn and a kind of local grain called 'Jizhuagu' (Chicken's claw grain) with which they brew a popular yellow wine. Buckwheat pies dusted with chilli powder are another favorite.The Luoba ethnic minority is very hospitable and places high value on ettiquette. When there are guests, they must be given the most distinguished seats and offered the most prized parts of each dish. The Luoba hunt with poisoned arrows, so meat must be treated after the animal is cut up. Before dinner, the host will drink and eat a little to show that the food is safe. Guests should eat all the food put before them on the table, or the host will be offended. Festivals:Some of the Luoba people observe festivals according to the Tibetan calendar, while others live according to their own calendar, so the Luoba ethnic minority has no unified dates to celebrate together. Most, however, celebrate the arrival of the New Year by slaughtering pigs, oxen or sheep and sharing the meat with others. Drinking, singing and dancing are other popular new year's pastimes. 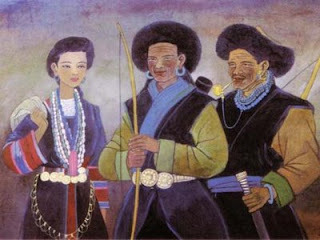 The above texts and photo are collected from http://traditions.cultural-china.com/en/127Traditions831.html but the common knowledge by Tani people living in India called them as Lhoba which is incorrect,hope the above information will help all to clarify the mistake. @Daachan.Thanks 4ur vist.Keep on visiting and suggest me on Tani related ideas. thanks 4 the info, but how do we know they r sons of Abotani? Dear tajen,the matter is that all Tani scholars opines that Luoba/LHOBA/LOBHA are sons of Abotani on the Chinese side.As i have mentioned already that a reasearcher on Tani language of University of Berkeley told Prof.Tabu Taid about this people disclosing that barring some clan of Luoba nationality all clans' languages has similarities with Tani language.